If your house looks like a used Toys’R Us and the kids flit from one thing to the next without even enjoying them, this is for you. 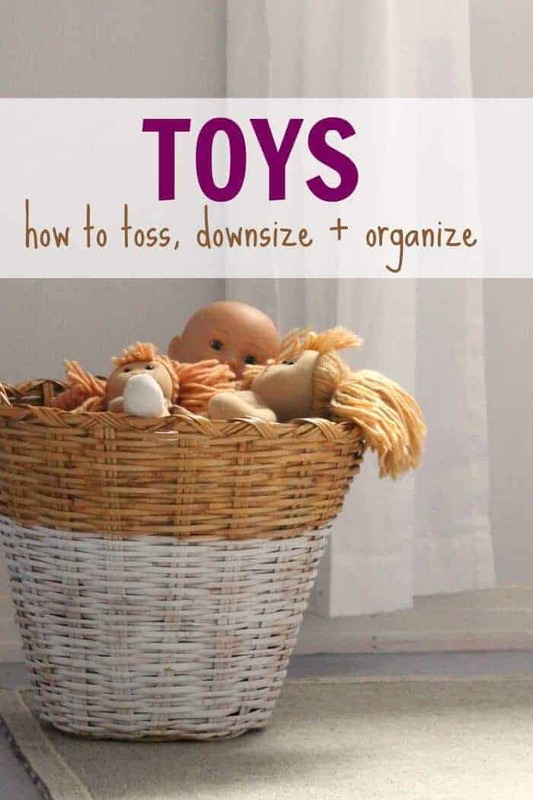 Here are some tips and thoughts on how to toss, organize, and downsize toys. Post contains affiliate links. Every once in a while I get an intense urge to purge. I’m married to a packrat and these times are very scary to him. I run around the house with a garbage bag or basket and start separating out things that I want to sell, donate or throw away. For me, it’s honestly better than shopping. I’d much rather get rid of things than accumulate things. Call me crazy. The rest of my friends do. But even if you aren’t like me I’d bet you still want to find a way to have toys without having the toys take over the house. I love seeing toys around the house here and there because I know this stage is fleeting. I like my children to feel that the house is a place to play and have fun, however, I don’t want the toys to be out of control and nearly impossible to tidy up. Am I the only one who minds toys everywhere? Does it bother you or your spouse? I think you can organize and downsize toys in a way that there is plenty of stimulus for the children without excess. Here are some of the things I do around our house to strike this balance. 1. Keep toys out of easy reach. I would never deprive my children of playing with their toys, however I’ve found that keeping all toys in reach actually backfires. Too many visible toys makes for toddlers flitting from one toy to the next without engaging. I keep all the toys that go in boxes – train set, duplo, wooden toy sets, etc. – in the bottom of a closet in the family room. If they request a toy or need something to do, I go to the closet and let them pick one out. This prevents pieces from getting mixed up and lost as well as keeping the mess to a minimum. It isn’t about withholding the toys from your children. If my daughter opens the closet and points to a toy then we get it out. When she’s done we pack it up. The kids get to make a mess, but know they have to clean up what they take out. Kids don’t clean up? Fix that with my easy peasy (and free) 3 step process to get kids doing chores! 2. Don’t be sentimental about toys if the kids aren’t. If you have truly sentimental toys, things people have made or brought from afar, I wholeheartedly think those should be kept. However, I don’t think we should be sentimental and attached to toys that our children never play with. Just because it was expensive doesn’t mean it’s valuable. If it’s a cheap plastic toy, doll, or stuffed animal they never play with don’t feel bad giving it away. When I feel the urge to purge I ask myself a few questions. Did someone we love gift this and is it sentimental to the giver? Is this a toy that never gets played with? Would the kids even notice if it was gone? If the answers are no, yes, yes then I put it in a donate pile. 4. Lay them all out and get a clear picture. The last time I did a major purge I designated the upstairs landing as the toy sorting zone. This time, I sorted and purged toys as I did major room re-decorations. I spread out all the toys and separated them into developmental age. As I was sorting I felt mildly ill because we had so many toys. You probably have no idea how many toys you actually have! I sure didn’t. Just think for a moment. Would they fill up an entire room ? Two? When I stood there and looked at all of them I knew that it wasn’t mean to get rid of some toys. I knew I wasn’t depriving my children of childhood fun. In fact, even getting rid of half the toys (which I didn’t do) would still have left them with more than they need. 5. Get your children involved in the purging. Now, I realize that asking children to help you choose which toys to keep and which toys to get rid of sounds absurd. However, kids know which toys they want to play with and which ones they don’t. Depending on the ages of your children this may be a great opportunity to teach them about generosity. It feels good to give and bless others, and it’s never too early to start explaining that principle to your children. If you know that the toy situation is out of control and you want to get a handle on it, now is the time! Don’t feel guilty or worry you are somehow depriving your children of fun. A child’s first and foremost need is for secure and stable love, after that the rest is just extra special. Are you a toy hoarder or purger? 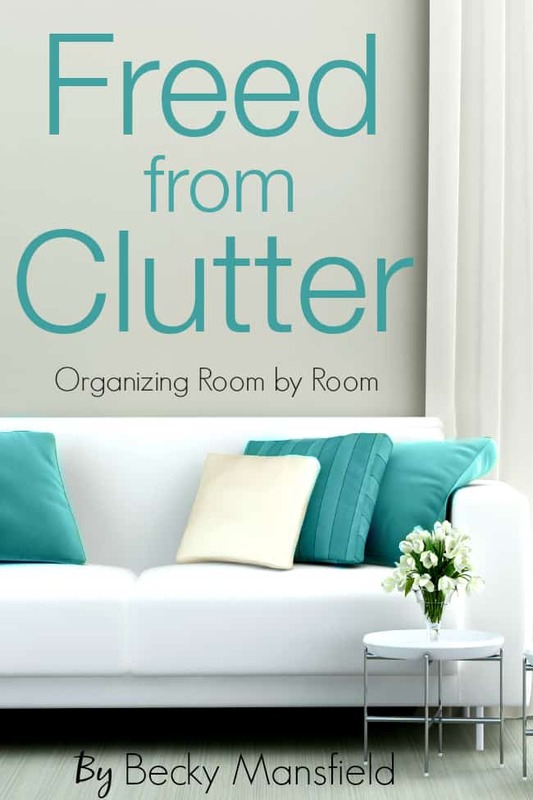 Need some help organizing? Here’s an awesome book you gotta check out! I’ve got a pile of toys that the kids don’t use or need anymore that I am selling. Of course now every time they see them sitting in the spare room they decide to play with them. Trying to keep them out of sight out of mind until I can get rid of them is tricky. I have 6 children from ages 9 to 2. I rotate toys every 2 months. It keeps everyone intrigued an occupied. My four boys are harder to occupy than my girls. But this trick works!! AMEN To All that !! : ) I’m embracing keeping the toys out of reach and loving it ! Thank you so much, Amanda!!! Girl you are SO RIGHT. Out of reach means more peace of mind. Whew! HI, Thanks for sharing. This is so helpful. I come from a family of pack-rats, my husbands family is the opposite. I don’t want to be a pack-rats but instead want my daughter to learn the value of the things she has and not be upset by the things she doesn’t. 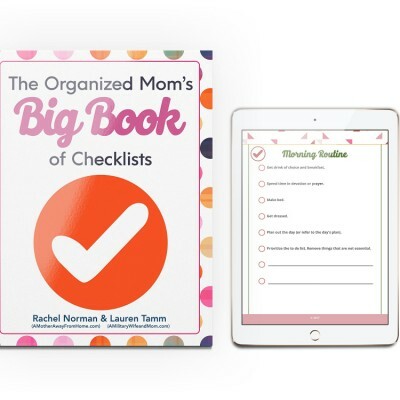 Its hard to maintain a healthy safe environment I want for my daughter while having so many things in the house, so this is ever so helpful to help downsize everything in general by using guidelines. All your thoughts and work put into your post is greatly appreciated! Thank You! Hi Melodie, thanks so much for your comments :) My husband and my family are the opposite of yours! It’s definitely a balancing act. I also love a good purge and have been thinking it’s time to downsize our collection a lot. I have a 5-year age gap between my kids, so I tend to hold onto EVERYTHING, thinking surely the younger one will use it someday. Here’s my dilemma, with toys in general. We don’t buy tons of toys in our household, and when we do, we try to purchase stuff that lasts, encourages free play and can be used in multiple ways. Most of our toy overflow situation comes from gifts from generous, well-meaning relatives. It’s usually novelty-type stuff that’s fun for the giver to give, but the kids lose interest after only a few days. Then I feel guilty for wanting to get rid of it, and worse, annoyed that this my problem to deal with, when I’m trying hard to keep our collection in check. Has anyone found a solution for this, other than to grin and bear it, and rotate toys? I would love to tell some of these well-meaning people to STOP GIVING US STUFF, but that feels really wrong. I am grateful that our kids have relatives who love them, but I sometimes wish they’d channel that urge a bit differently. I suffer with the same guilt, girl. THE SAME. I hate giving away or donating toys that were given by loving family members, even if the kids are over it or don’t care. I’m with you on “building” type toys which last a long time. I’ve just found that I keep them a bit, rotate some, and donate others. Often for a party or something I’ll specifically say “don’t give” or “please give xyz type of toy” and say it kindly and that’s that. Ha. This is something I’ve tried to do several times, but not with such great organization and purpose. It’s more just complete angst at the amount of toys they have and don’t play with that I go in headstrong and still can’t get rid of most. This is a great plan that I will be implementing! Thank you! I just done this about a week ago. I discussed this with a friend of mine and she told me that she purged all her daughters toys using the garbage bag style. She asked her daughter to sort out toys and put them in black garbage bags to store them in basement. She then took the opportunity to take a look of the stuff that her daughter put in and let them there for a week. She then waited for trash day and took all stuff out early morning with the other garbage for collection. This is what I have done and it really works. You know that what your children do not want is meaningless to stay there. Then you need to be a mean mom and chuck unwanted stuff out. If you want some tips, do let me know. yes now I feel more stress relieved. Sometimes we keep on rotating and storing toys for noting. When children loose their interest in them, its difficult to ask for them again. And most of the time you need a lot of effort to sort load them and take them to charity, and then you realize than the majority of them are thrown out. Hence might as well toss the unwanted stuff in garbage and take them out of sight as quick as possible to avoid changing minds. A friend of mine suggested that it is more convenient to do the big purge before children stop from school before the Summer holidays. She would be alone purging stuff that her children are no longer interested in and make sure that is out for garbage collection before they arrive back. That’s a great idea, before summer holidays because you’ll probably add some more in that time anyway! I was wondering if you could post a list of toys that you have found to be the most multi-age/multi gender Friendly. My son is turning 2 this month and I have 3 month old twin girls. My Family is asking for some birthday present ideas and I don’t want a bunch of random toys in my house. I want stuff that the girls will eventually use as well. What have been your family favorites? Lindsey, great question… I’m not the right person to ask it to though. Ha. We really don’t have a lot of toys except LEGO, Duplo, blocks, and trucks. My daughter has Barbies and dolls, but I am not a great ‘toy shopper.’ What they have my family gave. Sorry I’m not of more help! Art supplies! They keep their interest and they are temporary! Educational toys are gender neutral. Puzzles, fine motor skilled activities, books, play dough, paint, and coloring books. Hi Rachel, love your blog. I do try to pluge my child’s toys and she is already 10 and have lots of toys she no longer plays. When i try to involve her in throwing out the toys that are like for 3yr olds and she will tell me that she no longer play them… but she can relate back to a time where we used to play it together( she is the only child). I used to spend time playing with her. She is able to evoke so much emotions and memories with some of the toys and i grew all mushy inside and decide to keep the toys. Take poctures of you and your daughter with the toys. 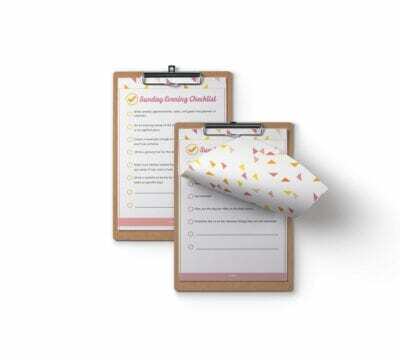 Write down the memories of the play times in her lovely words and then scrapbook the memories. Toss the toys. Have you ever used black garbage bags to toss toys? I was having a chat with a friend of mine and said that she tossed toys in clear bags, and while sitting on the curb for garbage collection, they were taken by someone else. Find a children’s home/Charity in the neighbourhood that you can donate all your unwanted gifts to. It really relieves the guilt that you are not just throwing them out but giving them to underprivilaged kids who will appreciate them! As a husband it feels like my wife is holding on to all the toys. I practically have to throw toys away behind her back. I have 3 kids and it’s getting to be too much. I almost want to throw/donate all the toys away and start fresh. Any advice ladies?